There are over 30 million RV enthusiast in the US, but what types are RVs and RV brands are the most popular among Americans? We at Replacement-Mattress.com did some digging to find out! 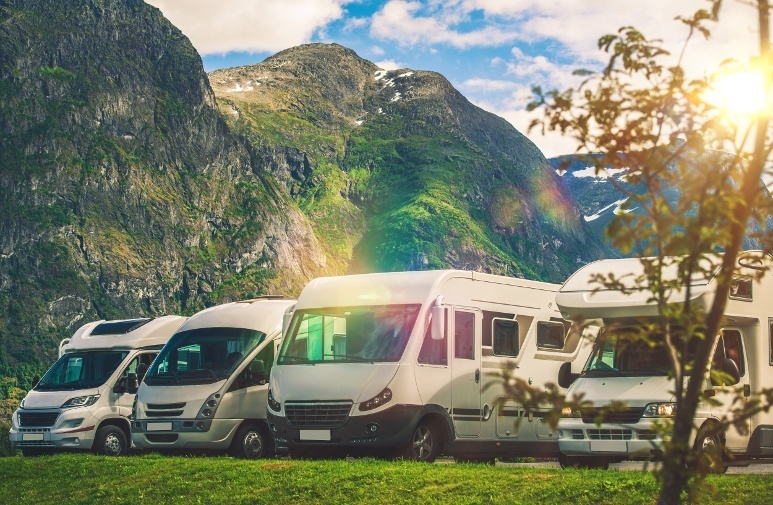 The recreational vehicle industry includes travel trailers, popups and motorhomes from Class B vans to Class C and giant Class A types built on various truck chassis. 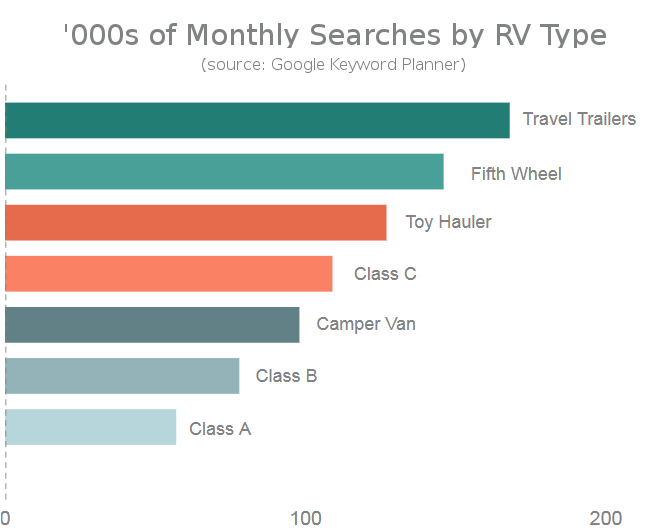 Newer van chassis, such as the Mercedes-Benz Sprinter and the Ford Transit, have made the Class B, B+ and small Class C motorhomes hugely popular, but travel trailers still take the lead in the type of RV searched for online. The growth of the oil and natural gas pipeline industry is helping the sales numbers of travel trailers and fifth-wheels too. Pipeline workers follow the work, and they are buying travel trailers and fifth-wheels to have a place to live. Pipeline areas are also seeing an increase in the growth of private RV parks that offer full hookups. Full-time RV living at established RV parks to downsize from mortgages fuels sales too. Each class of RV has its own advantages. Travel trailers are pulled behind a tow vehicle with a hitch just below the rear bumper. They are smaller than fifth-wheels with many being able to be towed by a standard pickup truck or SUV. Fifth-wheel trailers have a smaller version of the king pin plate hitch assembly like semis have, but they are installed in the bed of a heavy-duty pickup truck. Tow vehicles need to be heavy or super duty, making the combos pricey. Motorhome classes include the Class A, C, and B types. Class B is the smallest and based on van chassis. The B+ vans have a larger living area. Class C RVs use a larger van or truck chassis with the living area being installed to the rear of the van/truck passenger compartment that is retained. The advantage is having highway approved airbags and other safety features present. Class B vans also have these safety features. Class A motorhomes are built on larger truck chassis with passenger compartments built around the steering wheel and pedals. Seat belts are installed, but no airbags or highway approved rollover protection exists for this class. 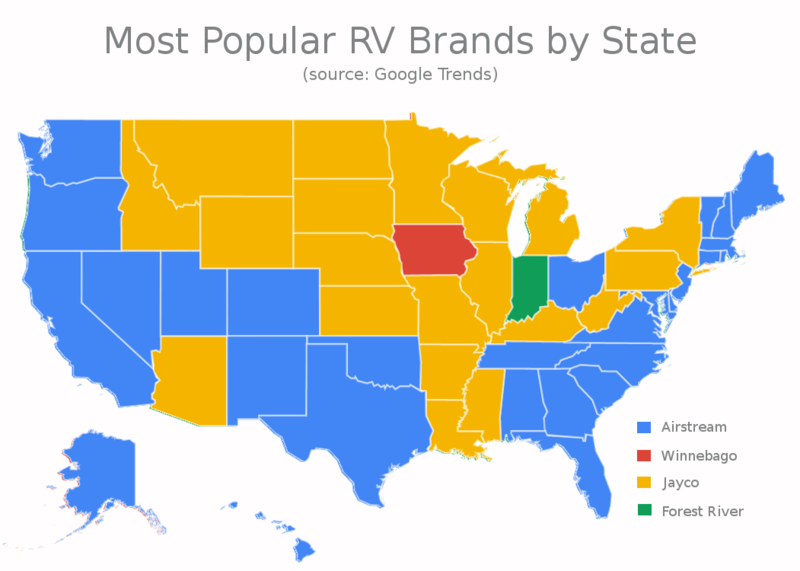 Airstream still leads the list of RV searches followed by Winnebago, Jayco and Forest River. The unique Airstream look is iconic and has become a status symbol in the RV community. Airstream to RVs is like the iPhone to smartphones. Winnebago is an established national brand that has been around for a long time. It has huge inventories of RVs from popups to large motorhomes. Winnebago also owns its own plants that make parts from raw materials used in its brand as well as the construction of other RV brands. Forest River is a Berkshire Hathaway company that makes RVs, commercial vehicles, park model trailers and pontoon boats. You will likely see plenty of toy-hauler RVs made by Forest River where quad and motorcycles get together. Jayco has a strong reputation for being affordable with a solid build quality. If you are buying an RV, you want durability and longevity for every dollar spent buying the RVs of your dreams. Jayco has found that sweet spot where the dollar value beats many other manufacturers. Entering the world of recreational vehicle adventure begins with online searches for the perfect RV for your family. You can spend forever pouring over every detail, or you can pick a brand with a history of customer satisfaction and reliability so you can hit the road as soon as possible. Set a budget, and stick to it. The fun is in the adventure, not the size or brand of RV. This entry was posted in RV Lifestyle and tagged RV brands, RV living.